Who signs “NAVAJO HANDMADE ES” ? Quick online research implies this is Mr. Sacatero’s work. The back is a concave oval measuring 2″ by 1 1/2″. The front has five small claws, arranging as a right-hand paw (??) at the bottom of the piece. The 5 ‘knuckles’ are small, perfectly-matched red coral (??). The piece is about 3/4″ thick where the 5 red stones are, but not solid. At the top, centered, is a single turquoise stone, mostly blue with distinctive black flecks. This stone is about 1/4 ” across. The turquoise stone is surrounded by 3 overlapping silver sworls. The 5 knuckles have tiny silver beads in uneven line on the top and bottom of the row of coral. I am curious if Mr. Secatero is prominent and respected, and if you can offer any interpretations…. a standard piece for a man to wear as a pendant? High dollar value? Historical importance? Thank you for your time. I’ll be grateful for any comment. I like the piece very much. Cannot find anything online that is at all similar. Wonder if the piece has special significance , in the paw shape with turquoise , coral knuckles plus 5 claws. is that of Navajo silversmith Elaine Sam, noted for her bear claw necklaces, bracelets, watches and pendants. Currently we only have one item by Elaine Sam in our store. If you click on the photo, it will take you to the page. Your pendant is beautiful ! Judging by its size, it is made with badger claws to represent either a badger or bear paw. As far as polishing, that’s a matter of personal preference. It looks nice as is. This pendant would be suitable for a man or a woman to wear. We don’t do appraisals from photos, but the value in a piece is in its significance to a person and it sounds like you hold this pendant in high esteem, so that means it has great worth ! I’m curious about the mark in a 2″ widest, cuff bracelet that appears to be overlay work. Inside, the mark looks like a capital “T” with the word sterling printed under the mark. The top center design is sunface and there are two bear claw designs, one on each side. It measures 6 1/2″ around, from edge to edge. I was not able to photograph the mark on the inside as it is not in the middle but near one end of the bracelet — it is a capital “T” with the word “sterling” underneath. I believe it was bought in either Santa Fe or Taos about 25 years ago. Thanks for any info you can give me. Your nice heavy overlay bracelet has a sunface and what the artists we talk to usually call badger paws although they say that the buying public would rather think of them as bear paws, so that’s OK with them too ! We’ve heard the stylized depiction such as on your bracelet referred to both ways. According to Hallmarks of the Southwest by Barton Wright, the hallmark T has been attributed to Navajo artist Tommy Singer. Early on he used the T, TS and and variations of a T often accompanied by a quarter moon or bird form. Since you said this was originally purchased 25 years ago, it is possible it is some of Tommy Singer’s earlier work, however without seeing the piece in person or seeing the hallmark it is hard to say positively. Tommy Singer is more noted for chip inlay and storyteller pieces such as the examples that I have used here. I personally have not seen simple overlay like this by him, although I have seen such bracelets by a number of both Navajo and Hopi artists. It is possible that this could be a Hopi bracelet or a Hopi style bracelet made by a Navajo artist that used the T hallmark. If you can send me a photo of the hallmark, maybe I can see something distinctive about the hallmark. Also a closeup of one of the paws, would allow me to see the black oxidation background better to see if it is textured or a flat wash. When I zoom in on the photos you sent, the dark background appears to be a flat wash, more typical of Navajo made Hopi style overlay. Below, for example is a Hopi style overlay bracelet made by a Navajo artist. It had simple, clean lines, no decorative stamping or embellishments. The black background was a wash, not texturized. It was sent to us as a Hopi bracelet and from the photos sent to us, it could have been, but as soon as it arrived it was clearly Navajo made and by an artist we were familiar with. So making positive determinations strictly from photos is difficult. If you click on this bracelet photo you can see more specs about it in terms of size and weight. We received and sold this bracelet a few years ago in our pawn shop. So the jury is still out, but here is some more info on Tommy Singer and Overlay. Known world wide for his silver work, chip inlay and necklaces, Tommy Singer pieces are highly collectible and sought after. The Tommy Singer family has been involved in silversmithing, stone and beadwork for a very long time, handing the art down from one generation to another. Tommy Singer grew up on in the community of Dilcon on the Navajo Reservation in Arizona and has been attributed as the first Native American artist to use chip inlay. This is where a silver piece is decorated with turquoise or coral chips. Overlay pieces are made of two layers. The bottom layer is a solid sterling silver piece. The top layer has a cutout design. The cutout is placed over the bottom layer and the two pieces are “sweated” together, that is heated so that they become one. The bottom layer (background to the cutout) is usually accented. The Navajo silversmiths oxidize the bottom layer which darkens it. Hopi silversmiths typically oxidize and etch the background (texturize it) with hashmarks. 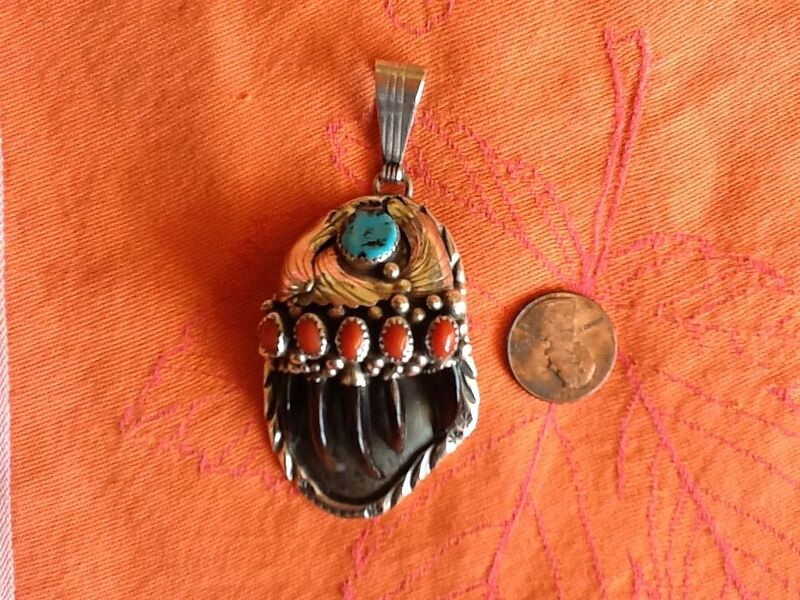 Navajo artist Russell Sam – Bear Pendant – Info Please? I have come into the possession of a piece by Russell Sam and have tried in vain to find out anything about the artist. I wondered if you might have some info on him or might be able to point me to someone who might have some biography info on him. I would appreciate any help you could give me. I have attached a scanned picture of the Russell Sam pendant. If you know anything at all about the artist, I would appreciate whatever info you may have on him. Thank you so much for your time and trouble. Russell Sam is a Navajo silversmith from the Gallup, New Mexico area who is still producing as we are currently purchasing his items. In fact, we have a very similar pendant to yours in our store right now. Many members of the Sam family are silversmiths in New Mexico and a number of them had worked for the Atkinson Trading Company in past years.